When thinking of British architecture, black and white Tudor beamed houses and rambling stately homes spring to mind. However, while Britain has a long history of beautifully constructed buildings, it is not just in the past where we can find pinnacles of architecture. In fact, there are a huge number of spectacular modern British buildings that have made their mark on the landscape of the United Kingdom as well as on an international scale. Championed by enthusiasts like Elain Harwood and the Twentieth Century Society, these buildings are to be protected and cherished as design triumphs. One of the best beloved and most modern looking British buildings can be found on the London skyline. 30 St Mary Axe, or The Gherkin as it is more commonly known, is the city’s most widely recognised example of modern architecture. The tower began its construction in 2001 with the intention of replacing the damaged Baltic Exchange building. Commissioned by Swiss Re, the new building was designed by London-based architects Foster and Partners along with structural engineers Arup. The glittering skyscraper is built with steel and glass shaped into diamond patterns and stands at 180 meters, making for the second tallest building in the City district. It was officially opened in May 2004 and is renowned for its unusual cigar-shaped structure. Another iconic modern building in Britain can be found in the second city, Birmingham. The award-winning Selfridges department store in the Bull Ring shopping centre has become an international landmark due to its futuristic design. The building embodies the 21st Century ‘blobitecture’ movement that draws inspiration from organic and curving forms. Inspired by a Paco Rabanne chainmail dress, the building is covered in 1,500 aluminium disks and curves to mimic the female form. On the inside, a maze of snaking white escalators make a bold statement. The building finished construction in 2003 and was designed by the avant-garde architectural and design practice Future Systems. 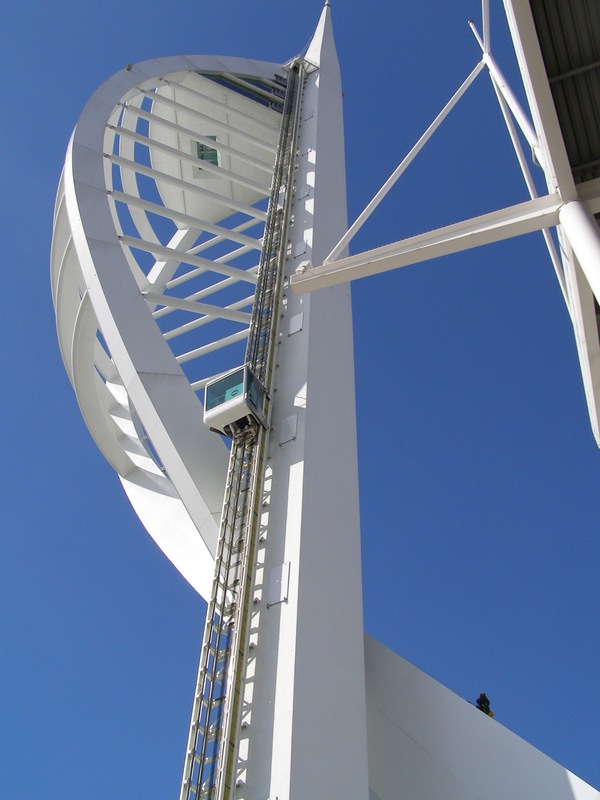 The Spinnaker Tower in Portsmouth is another example of the extraordinary modern buildings that Britain has to offer. Construction began in 2001 as a part of the Renaissance of Portsmouth Harbour Project, which aimed to rejuvenate the city. Standing at 170 meters, it is the tallest accessible structure outside of London and has a number of viewing decks on which the public can take in the view. The iconic steelwork curve is representative of ship sails billowing in the wind, which pays homage to the city’s history as a shipping town and its maritime heritage. The Spinnaker Tower officially opened in 2005 and has had 2 million visitors since then, making it one of Britain’s most popular architectural landmarks.